So today's post is a layout. Yes, I try to scrapbook too. 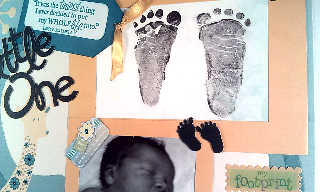 Right now I am still working on my first son's scrapbook. This page was started 2+ years ago and it is finally finished. 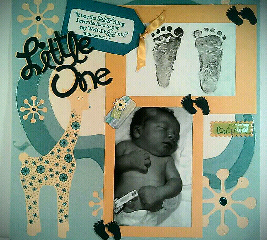 The Paper is from Die Cuts With A View, Nursery collection. The foot prints and "Little One" are cut from the Cricut New Arrival cartridge. Ranger's Stickles have been added to the page in Lagoon. The tag and stickers were in my stash. The ribbon is from American Crafts. I stamped the sentiment using a Fiskar's stamp set Precious Baby Quotes. It was stamped using the Tim Holtz Distess Ink in Peacock Feathers. Hello everyone and welcome to my blog. Today's project was created for the Pink by Design challenge of the week, RED WHITE and BLUE, PbD03. I had so much fun creating this project and look forward to joining more challenges. So, here are some of the supplies I used to create this card. I have used a free Kadoodlebug Designs image, Watermelon Bear, in a PDF format. I printed this on cardstock and cut out by hand. The fireworks are from the Cricut cartridge Stand and Salute. The ribbon flags in her hands were made with the Jolees French General ribbon wrapped around a standard toothpick which has been cut done. The background paper is from My Minds Eye Lime Twist. 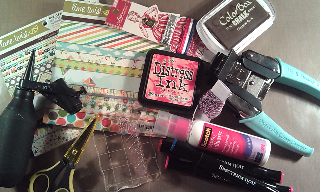 The star patterned paper was air spritzed with Spectrum Noir markers user my Spritzer tool. The stripped paper was spritzed with Smooch spritz. Divine Twine in red, white and blue was used to complete the background. The sentiment is from Fiskars. Hello everyone. So, I am still trying to get the hang of this blogging thing. 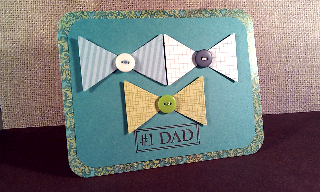 I just thought that I would share some cards that I made for fathers day. This card is made with a My Minds Eye card base. The bow ties are made from triangles cut from with a Sizzix Sizzlits Window and frame making set and glue together at the point. The Sentiment if from Fiskars. The paper used for the bow ties are from Echo Park Dots and Stripes and from Martha Stewart. The ink is Color Box. These tie cards were super easy to create. Once the tie pattern was cut out, I ran them through the Cuttlebug with the candy cane embossing folder.